First make the roasted pork belly. 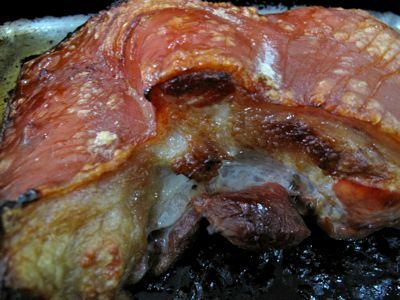 This can be done a day or more in advance, and you will need a roughly 1.5-2 kilo piece of fatty pork belly. The original recipe calls for removing the skin, but I thought that was just a bit crazy, and I wanted to keep the skin and somehow use the skin in this sandwich… So take the slab of pork and slit the skin with a blade (I used a standard rubie shaving blade) but a really sharp knife would work too. Then rub the entire piece of meat with about 1/3 cup +1-2 tablespoons of kosher salt and an equivalent amount of sugar. Stick this in a non-reactive platter or even a large food safe plastic bag and let it hang out in the fridge for about 8 hours or so. Next, turn your oven up to roughly 430F, take the pork belly out of the fridge and pat it dry, removing any extra salt that is clinging to the meat. Then stick it in a pan and into the oven for roughly 40 minutes, then turn the oven down to 250F for about another hour until the pork belly is done. Cooking times may vary due to the thickness and size of your pork belly. I used a pinoy belly, and they have a tendency to be thinner than some western equivalents. When the pork is done, remove the pan from the oven, crank up the heat back to say 400F, then carefully remove the skin from the pork belly by running a knife just between the skin and the soft fat just below it. It should be really easy to do this, and try to get as little fat behind the skin as possible. Stick the skin onto a rack over a pan and put it back in the oven for some 10-14 minutes or until the skin is really crisp and wonderfully golden brown. 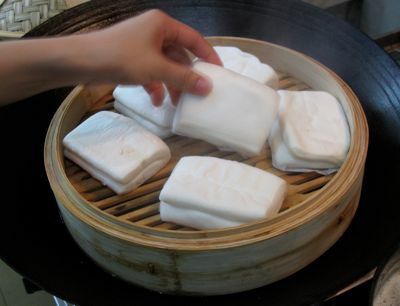 Meanwhile, put a steamer over boiling water and steam some (store-bought) cuapao or momofuku style buns until soft and very warm to the touch. Now for the super easy sandwich assembly… Start with a very generous shmear of hoisin sauce at the bottom of the sandwich. Add some 3 or 4 generous slices of pork (reheated if it spent the night in the refrigerator), a little more hoisin, some slivers of quickly pickled cucumbers, some chopped green onions and finally a shmear of chili sauce on the top part of the sandwich. Sink your teeth into this amazing sandwich and feel the explosion of flavors from the salty sweet hoisin to the rich fatty pork, cool slightly acidic cucumber pickles to the searing spiciness of the chili sauce. The softness of the cuapao just envelopes this all and is the perfect pillowy neutral foil to the fillings. Absolutely wonderful. that’s it, salt and sugar lang? it’s calling me, it’s calling meeeee! YUm YUm! thanks for sharing. will make it very soon. do you have a nice recipe for the buns? This is definitely going to make an appearance at tomorrow night’s dinner table. MM, How thick was that pork belly when you began? ness, they sell them at Chinese groceries, and sometimes at places like Unimart, Cash & Carry, etc. thea, there is a recipe for the buns in the Momofuku cookbook, but it looks a bit involved… millet, yup, just sugar and salt, and the resulting pork is what is used in Ramen as well. looks so good!! I wonder if we can buy those cuapao here, eh bettyq? Are those your teeth marks on the sandwich, MM? Just curious. Yes I have seen cuapao tons of cuapao buns in Ongpin! This would taste even better with boiled egg ala siopao! 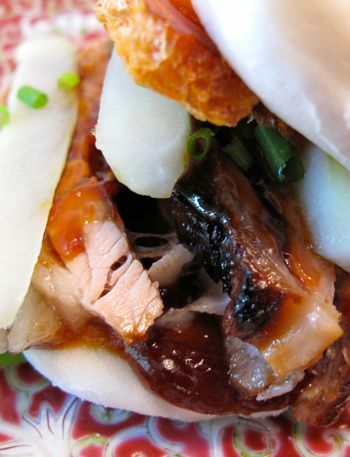 MM, would you know off the top of your head if Momofuku-type buns are available in Chinese groceries here in the U.S.? (Now even asking that question seems silly. Duh, I’m sure they are.) Thanks for posting this! Will scour the stores for cuapao and give this a try MM. Thanks! Andrea Nguyen says in her Vietnamese cookbook that you can use refrigerated buttermilk biscuit dough for a quick “Chinese bun”–steam the biscuit dough instead of baking it. Haven’t tried it yet but a friend swears by this short-cut. That sounds and looks drool-worthy. Reminds me of the cuapao sandwich in San Jacinto with braised pork belly and something akin to pickled mustasa. This sounds way better though. 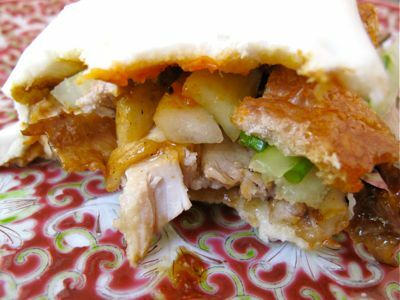 MM,your cuapao sandwich reminds me of the peking duck because of the hoisin sauce ,the green onion and the crispy skin but wrapped in something like a tortilla. Jean go to a Chinese bakery and you will find cuapao. I also see them being sold in the groceries in Chinatown it is inside their glass refrigerators. In fact my Chinese co-worker eats this for lunch but no “palaman”. Been a lurker here for some time, first post. You can find Cuapao at Shopwise (not sure if they have it in all branches; I usually go to the one in Libis). They’re also available at Little Store, if anyone’s from the San Juan area. OMG! I have to wipe off the droll while reading this! hahah Will try this at home when I get my hands on some cuapao buns. Thanks for sharing MM! ooooh cant wait to try this!!! This is a must make!! ohh this looks so delicious. its a bad idea checking out your site when im trying to diet haha. but in any case its a friday! 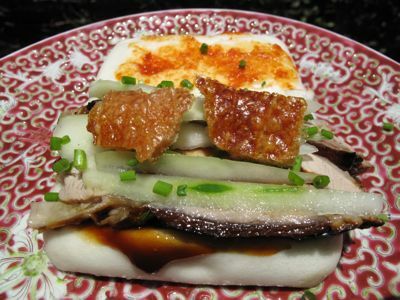 i’ve seen them serve the cuapao buns here northern style with minced pork in sweet, sticky sauce and green onions. Kanamit sini! Very nice visual imagery while I munch on a granola bar. Hi mm, can I cook this using turbo broiler? also if i can’t find the bun, pwede kaya yung soft taco or pita bread? This looks amazing! 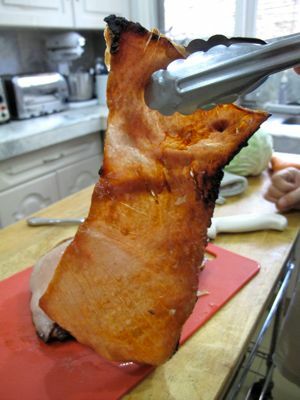 And do able in most cities – I finally found a place that sell pork belly with skin and will try this soon! Thanks! 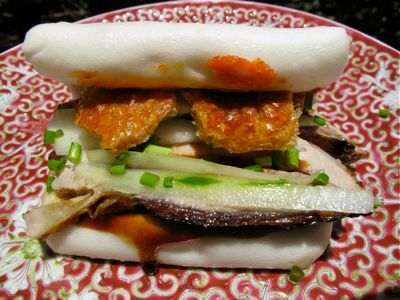 I just have to find those buns and i’m definitely gonna try making these pork buns. Can’t wait for the weekend, must go to a chinese grocery. if i try this, this will be the first time i work with pork. gaaaa. but it looks sooo good. so just to make sure –salt AND sugar? I will take this anytime of the day :)….. We do have something like this in singapore and I believe taiwan and HK also has but not as yummy as what the photo above shows. They do use a pork stew with some lettuce and cucumber. OMG, your photos are such a delight! This is a temptation I would definitely give in to! Your post is so timely as there is a growing trend in Stockholm to sell pork bellies with a generous layer of fat and skin on. A couple of years ago, this was nonexistent, and one has to order it from one of the posh fresh produce markets and it would cost a fortune. Today, it is not an usual sight any longer to find a nice cut or two at the supermarket, though it still a bit expensive, at least it’s available. Many thanks for an inspiring and delicious post! lee, am sure your granola bar started to taste like cardboard after you read this post, no? Anthony Bourdain is missing a lot if he does not check out this post, the pork lover that he is!! Thanks, MM, for great visual on this delicious concoction. We are all salivating. This must be good. We also use cuapao for our hongma….yummy!!!! sinful!!!! OMG! MM this is to die for. I am just starting a diet and reading this is making me want to make it!!! I have to wait… even yesterday’s blog, makes me think of my empanada making days…It’s been a loooong time since I made them. Lots of items on your blog that is piling on my list, but keep it coming MM. One day I will be able to try them out. MM: is this the same as siopao bun? Here in my area, chinese stores sells cooked siopao buns without anything inside. I was thinking one time if I buy these, poke a hole into it and fill it up with shredded adobo. Then serve. There are also different variations – like meatless but with chives and garlic. 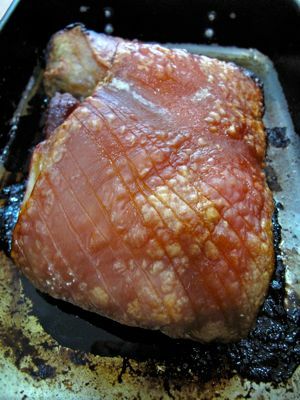 I am quite amazed at the resurgence (in the “western world”) of fat, pork, skin – the rave (if you can even call it that) right now here is roasted pork (with crackling) – roast pork with skin on. hen lin also sells cuapao bread. they are smaller than the ones shown in the photos though. 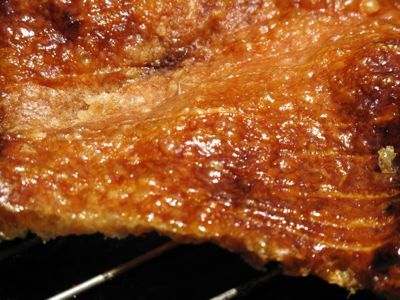 What’s the best way to reheat the liempo and crackling? The pork belly I cooked yesterday following your method was quite large and there’s a lot left over. I wouldn’t want the liempo to dry out during reheating. In lieu of spring onions, I used shaved leeks instead to more closely replicate the Peking duck experience. Does the original Momofuku recipe use green onions? BTW, cuapao buns for steaming are available at the Legaspi weekend market in Makati. Thank you, Marketman. Now for the rest, I shall try and slice thinly (like the Japanese chashu) for ramen. 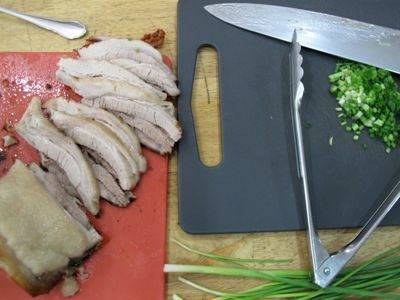 Pork belly is really so versatile! More power to you! Chito, for ramen, keep pork cold, slice as thinly as possible, and simply place the slices in the piping hot soup broth with the ramen. my mouth is salivating. looks really good. Made this on the weekend, OMG it was good. Our Asian market here in Richmond, BC had these enormous buns (they called them Chinese hamburger buns), about twice the size of the cuapao buns I had as a kid in Manila. All the better to put more pork in! Didn’t have chili paste, but a potent chili oil was drizzled over the pork. YUM!